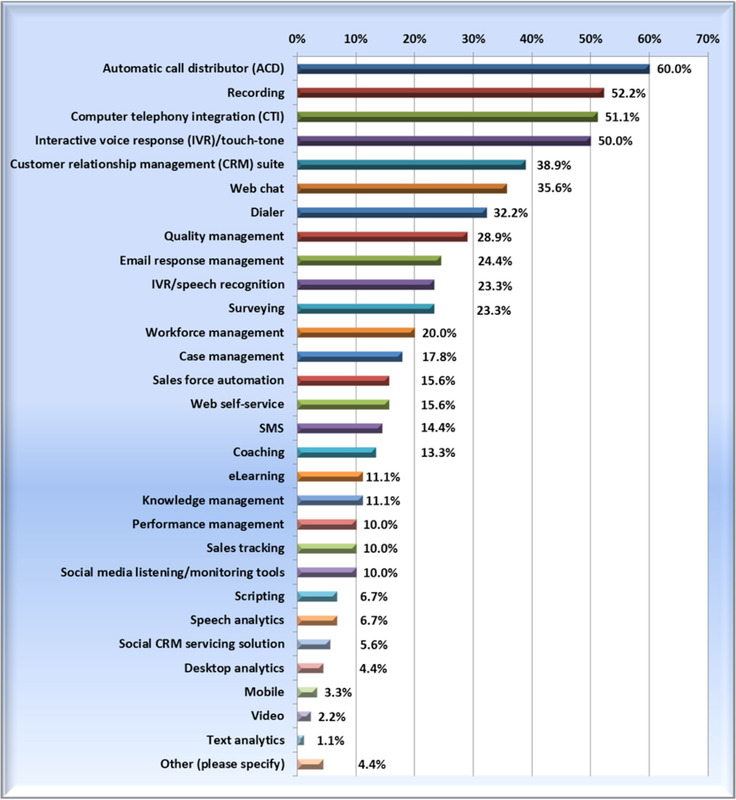 DMG Consulting conducted a worldwide benchmark study regarding cloud-based applications, channels, and satisfaction in Q3 2013. This study of 169 enterprise, contact center, IT, operations, and sales and marketing executives, managers, and leaders in organizations of all sizes found that 62 percent of the respondents' organizations were already using one or more cloud-based contact center systems or applications. Moreover, nearly 46 percent of the responding companies not yet using a cloud-based contact center solution planned to do so in the next 18 months. Contact centers were slow to get on board with cloud-based solutions, but the pace of adoption has picked up dramatically. The accompanying graph shows the many different contact center applications being used in the cloud. Sixty percent of the benchmark study respondents are using cloud-based automatic call distributors, and more than 32 percent are using cloud-based dialers. Greater than half (52 percent) of the respondents are using cloud-based recorders, which aligns with market direction, where users of cloud-based contact center infrastructure typically utilize recording solutions provided by these vendors. Nearly 39 percent of the respondents are using CRM solutions in the cloud and almost 36 percent are using a cloud-based Web chat solution. Only 20 percent of respondents said that they were using a cloud-based workforce management (WFM) solution. There are many takeaways from these findings, but an obvious one is that enterprises are increasingly using a hybrid approach, combining both on-premises and cloud-based solutions. DMG believes that this is the future direction for the contact center technology market, although we are already seeing companies asking their cloud-based infrastructure vendors to broaden their suites by providing more of the traditional add-on modules, such as WFM, quality assurance, surveying, and more. The most significant areas of unease are related to the platforms and dependability of cloud-based contact center solutions. In our work on this topic, DMG has found that companies expect more from their cloud-based vendors than they do from internal IT, as a primary reason for moving to the cloud is to address areas of weakness in the performance of their on-premises applications. Forty-two percent of respondents indicated concern over their vendor's ability to meet service level agreements; 39 percent ranked platform reliability/up-time as a top concern; 34 percent pointed to network bandwidth and reliability as a major issue; and 33 percent questioned the quality of service. Thirty-two percent showed a lack of confidence in connectivity and the dependability of carriers. This benchmark study answers many of the questions that companies have been asking. It shows investment priorities for 2014, which systems and channels are being used today, and initiatives planned for the future. It provides a detailed breakdown of how these new systems and channels are going to be acquired—on-premises or in the cloud—and makes it clear that the cloud is not a passing fad. To get a copy of the complimentary report, go to bit.ly/1jhMAZI, and see how your company compares to others in the market. The new CorvisaCloud boasts several new features and deep Salesforce.com integration. Pure cloud contact center brings setup simplicity, enterprise-class support and operational security to small and medium-sized businesses.